(APACHE JUNCTION, Ariz.) — The Arizona Game and Fish Department (AZGFD), in partnership with the Dolly Steamboat and the Arizona Desert Bighorn Sheep Society, is offering a two-part opportunity to view and learn about desert bighorns, one of Arizona’s most fascinating native mammals. Desert bighorn sheep are true icons of the wild American Southwest, thriving in some of Arizona’s steepest canyons and most rugged mountain ranges. In addition to hosting a pre-viewing workshop in Mesa on Friday evening, the department offers a unique opportunity to view these magnificent animals on Saturday during a specialist-led cruise aboard the Dolly Steamboat on Canyon Lake, in an area virtually inaccessible except by boat. “During the heat of early summer, just before the monsoon hits, water is a scarce commodity in bighorn country. 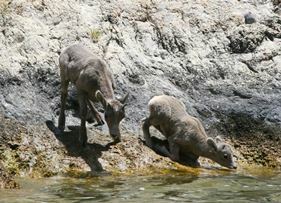 This makes mid-June the best time of year to view young lambs and family groups coming down to the lakeshore to drink,” says John Dickson, AZGFD wildlife manager in the Canyon Lake District. The Dolly Steamboat offers both open-air decks and air-conditioned viewing areas during the 3-hour cruise. Bald eagles, deer, and other wildlife are often also seen on Canyon Lake from the boat. The special event is broken up into two days—a morning cruise and a pre-cruise evening informational workshop (optional). Friday, June 23 pre-workshop, 7-9 p.m. at the AZGFD regional office at 7200 E. University Drive, Mesa. This free presentation will give an overview of bighorn natural history and current management and conservation efforts. Presented by Amy Burnett and Wildlife Manager Kriselle Colvin. To register for the workshop session, contact Burnett at (480) 324-3548. Saturday, June 24 Canyon Lake bighorn viewing tour on the Dolly Steamboat, 8-11 a.m. The three-hour boat tour led by AZGFD wildlife specialists leaves from Canyon Lake Marina at 8 a.m. Cost is $35 adults, $33 seniors (plus fees). Space is limited to 139 passengers. The boat has restrooms and is accessible. Participants are encouraged to wear comfortable light clothing and bring a camera, hat, sunglasses, sunscreen and binoculars. To register and reserve your spot on the boat tour, call Dolly Steamboat at (480) 827-9144 or book online at www.dollysteamboat.com.